The PMC-5231 is a web-based intelligent Power Meter Concentrator developed to maximise the potential of the PM Series range of Smart Power Meters. It offers a webpage interface, and features various functions such as: power data collection, logic control, power demand management, data logger and alarm notification functions. The PMC-5231 connects to PM Series Smart Power Meters via RS-485 or Ethernet interface to read the power data measured by the power meters. It then records these power values in real-time in a data logger file. It can autonomously send the recorded data to a server of choice, where it can be interpreted via PMC Data Server software or SCADA software. Additionally, further I/O devices can be added to connect to extra sensors (such as Temperature or other Environmental parameters) via use of the XV series of Daughter boards or M-7000 range of I/O modules. 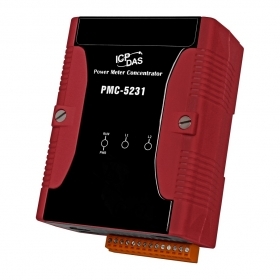 The PMC-5231 can also connect to standard Modbus TCP/RTU Slave modules. By working with the I/O modules, and functions such as IF-THEN-ELSE logic rule execution and alarm notification functions including Email/SNMP Trap, the PMC-5231 offers more thought-out power demand management and alarm notification functions, and is able to perform load shedding of the devices if required, and enables real-time monitoring and control of the power consumption of the devices. COM 3 RS-485 (Data+, Data-), 2500 VDC isolated, Speed: 115200 bps max. COM 4 RS-485 (Data+, Data-), 2500 VDC isolated, Speed: 115200 bps max.
? Allow to connect to up to 8 remote Modbus I/O modules. (Modbus RTU or Modbus TCP) ? Allow to connect to up to 8 remote Modbus I/O modules. The DP1200 DIN-Rail Mounting Power Supply provides a single 24V output rated at 5A.